Viresco™ is the name we give to a number of different micro-organism based products that are used in aquatics and horticulture. These products are all dry soluble powders which have unlimited shelf life if kept dry. The products are usually applied in solution. These powders also contain nutrients for the microbes as they come back to life from their dormant state. One of these nutrients is soluble Humate. For the aquatic market, we sell Viresco™ products that take out of water nutrients that are the food source for filamentous algae and algae bloom (green water). Consequently the algae dies of starvation. Some Viresco™ products contain microbes that digest organic waste. This biodigestion is very efficient and very readily cleans up the sides and bottoms of ponds as well as the filters. Filamentous algae is also called blanketweed, string algae and silkweed in different parts of the world. 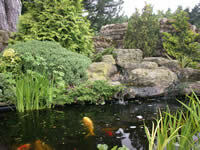 These aquatic Viresco™ products also improve the health, growth and disease resistance of pond fish. Similarly, in the horticultural world, our Viresco™ products offer a very good method of improving the health and disease resistance of all manner of plants instead of using pesticides. As pesticides become more and more restricted in use along with the desire of many growers to move away from using them, changes have to take place in horticulture. Our Viresco™ products give to the gardener and the professional horticulturist alternatives to using pesticides. Viresco™ microbial products work better in conjunction with humic acids. Humic acids act in plants like vitamins do in animals. Our humic acid, called Humate, is particularly reactive. Very small amounts are used in composts and in irrigation water or fertiliser solutions. They give a tremendous boost to the growth and health of plants. The first thing usually noticed is a distinct increase in root mass. This, in itself, helps to produce more healthy, stress resistant plants. As well as improvements in plants, improvements in growing media occurs. Better water holding and improved aggregation of the soil particles are two of the benefits that arise from the use of Humates. Our Humate is a very powerful food source for micro-organisms found in soils and in pond systems. Our micro-organism based products have been tested with a number of different humic acids from around the world and none has been found that comes anywhere near to Humate in regard to boosting the population of micro-organisms. The Viresco™ products are micro-organism based and are used in aquatics and horticulture. Through these webpages, we offer for sale 6 different Viresco™ products for aquatics and 9 others for horticulture. There are currently just under 50 different species of micro-organisms used in the 14 products. The mail order price of each product is the same worldwide.